What the hell kind of description is "juice drink in a blend with another juice"? Hello? I want to know what the OTHER juice is! Or is it a secret juice perhaps? Well, looky here. 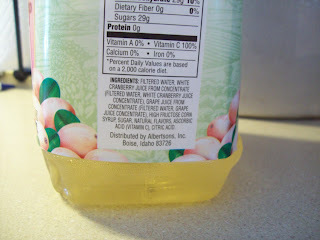 Why, it's white cranberry juice from concentrate mixed with apparently top-secret grape juice from concentrate. 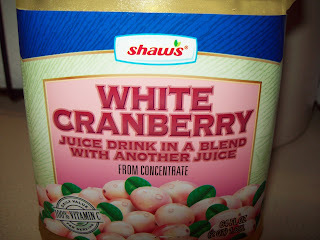 Wouldn't it be more succinct for Shaw's to simply label it "White Cranberry and Grape Juice Drink"? Hey I didn't realize we were neighbors. I live in RI (on the MA border) and I shop at Shaws, too. I'll be sure to avoid their juices in the future! I'm confused! It's not your fault. It's easily done! I think these thoughts when Wonder offers us "Made With Whole Grain" white bread. Uh, not so much. I'm a South Shore blogger....and happened to notice in Stop & Shop just last evening when I was doing my shopping that the White Cranberry mixed juice by Ocean Spray states which combined juice on their label. (I happened to drink "Cran-Grape" so, when scanning the aisle...stumbled upon "White Cranberry" and saw "White Cran-Strawberry".) This was the first time I noticed it, too! Funny you should blog about it today!! LOL! Maybe it's one of those potluck things where you got the grape juice version, but the next person may have prune juice as their "another juice"? As a marketer, I crack up at things like this. The money and energy to print "juice drink in a blend with another juice" is classic. White Cranberry Juice Blend wouldn't have worked? LOL. I run from any juice that says "drink" on it. I like my 100% juices. And yes, juice drinks are so odd. Why don't they just call it Sugar in a bottle? That's what it is, right? Hilarious. Thanks for a nice funny moment in my day! I just want to know how hard one has to concentrate in order to get the white cranberry juice and/or grape juice. Does it jump out of the bottle if I concentrate hard enough? Wouldn't that be a cool trick to teach the kids? Especially the ones who can't reach the top shelf in the fridge. Definately a WHAT THE HECK? Moment. Yeah, "another juice" is way too vague for me. Kind of like mystery meat. Weird label aside, that stuff is yummy!